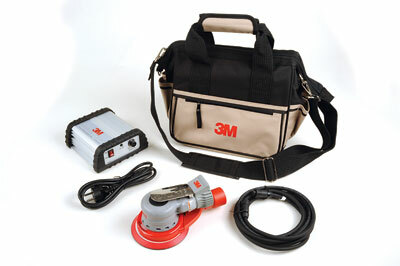 We first broke news of 3M's brand new, electric random orbital sander back in June in F&C194. For the majority of readers, I suspect the concept of a compact, low profile machine like this represents quite a departure from the apparatus typically in use. In commercial circles a machine like this might be considered the norm; light in weight, robustly built and variably configured, so why not in the smaller workshops of the discerning furniture maker? Any suggestion that a change in thinking might be to your advantage is based on more than a hunch. Firstly this machine has been designed with a full rubber casing that not only absorbs more vibration than earlier models but also contributes to a reduction in noise levels. My guess is that any vacuum extractor attached to it will sing a great deal louder. Inside the unit the motor is contained within a sealed chamber separate from the electronics to resist dust ingress. Variable speed settings are selected via a pair of +/- buttons on the back of the case where the screw lock power cable attaches. Either one has to be selected when the machine is powered up for the first time. Power comes in the form of a 30V DC 5A supply from a 240V AC transformer. 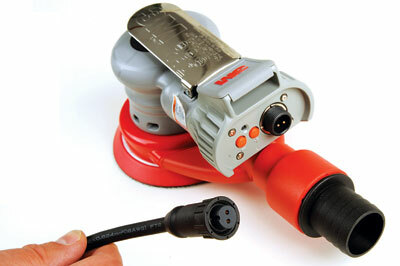 When run off an auto-switched vacuum, the transformer is the trigger and not the tool. There was no built-in extraction function on the unit we had, therefore it needed to be hooked up to a separate vacuum. Alternatives to this arrangement are available so just be aware that you need to specify your preference. The new range is available in four orbit sizes from 10mm down to 2.5mm, each one identified by a different coloured palm trigger; chrome signifies 2.5mm orbit. The body shape includes a wrist support, which isn't present on the airline fed machines and is a new consideration. I wasn't entirely convinced of its benefits at first, when the machine is already extremely comfortable to use, but perhaps over a prolonged period of use it might well be appreciated. 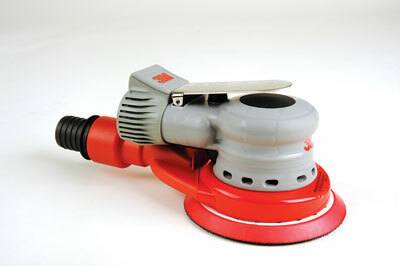 Weighing less than 1kg it can be used away from the bench and with fine grit abrasive - remember itâ€™s a finishing sander - the vibration levels are very low. On bare timber and finished surfaces it is quite possible to eliminate any scratch pattern. Slow the motor down and you have a perfectly acceptable polishing machine.